Nonspecific host resistance is provided by effector cell systems, including the mononuclear phagocytes, i.e., circulating monocytes, and tissue macrophages (MOs), natural killer (NK) cells, and polymorphonuclear granulocytes (PMNs). These cells, together with cytokines, play various roles at different stages in the pathogenesis of HSV infection (Morahan et al. 1985; Mogensen 1979). 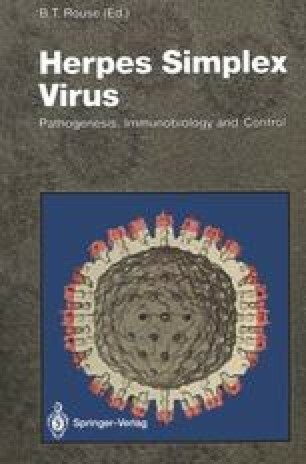 Immunomodulation of nonspecific resistance is one useful approach to control HSV infection (Morahan and Murasko 1989). It has been effective in reducing mortality against HSV infections in immunosuppressed animals (Morahan and Pinto 1991) and may be especially useful in combination with chemotherapy (Connell et al. 1985).